As has been noted on my timeline, #Badgers Bob Bostad played LB at UW-Stevens Point. PC thinks highly of him. We have had players win numerous awards. Few compare to the honor the @USBWA gave Bronson Koenig. I have a short item on new #Badgers assistant Bob Bostad filed. It will be posted soon -- I hope. Technology? Yea. Officials for #Badgers -Ohio State: DJ Carstensen, John Gaffney and Kelly Pfeifer. Tipoff scheduled for 8:05 p.m. CT. Welcome back to the starting lineup, Bronson. 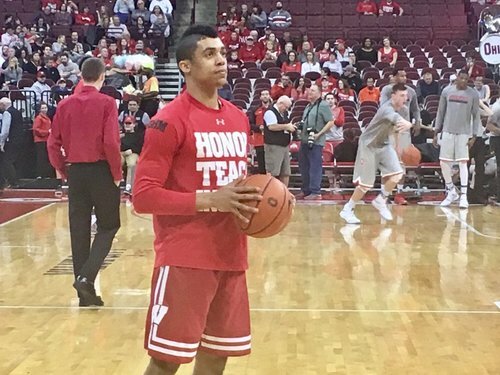 As expected, Bronson Koenig returns to the starting lineup tonight at Ohio State. Brown, Happ, Hayes and Showalter join him. 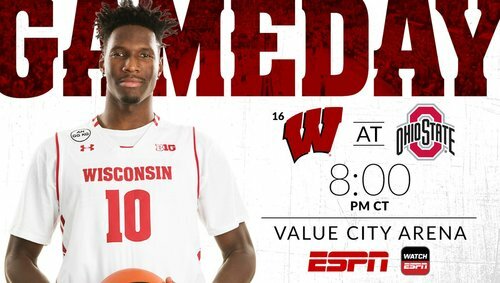 Join me, @drewhamm5 , as we tweet through #Badgers /#Buckeyes game coming up at 8 CST on ESPN. 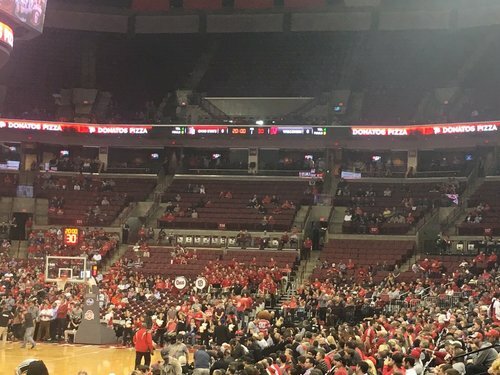 To be polite, we have a late-arriving crowd tonight at Value City Arena. Lots of good sections available. When D'Mitrik Trice played here in the 2015 Division 1 state final, there were 10,664 in attendance. Might not reach that total tonight. Crowd right now more like and early-morning game on Day 1 of B1G tourney. Students small in number. Game time in Gray! Let's Go Bucks! In his six years at UW, new ILB coach Bob Bostad coached 11 guys (TEs & OL) that eventually got drafted, including 3 1st-round picks. It's so quiet here, pretty sure I heard the skin contact from the Hayes vs. Moesch rock-scissors-paper battle during lineup intros. Thought Bostad would be back, but surprised it's on defense. Wonder if a move back to offense might happen when NCAA adds a 10th assistant. MSU, who the Badgers play on Sunday, steamrolled Nebraska tonight. Miles Bridges & Nick Ward both have 20 points. Sparty heating up? #Badgers win the tip and we're underway from Columbus! #Badgers Happ got ball and was swarmed by 12 OSU defenders. Welcome back to Ohio #3tto Brown! 3TTO BROWN DOING WORK IN HIS HOME STATE EARLY! OSU doubling both #Badgers Happ and Hayes immediately. Trice and Thomas in for Happ and Showalter at the 18:09 mark after early turnovers. BK lights splashes from outside - he's just two away from tying Ben Brust's school record for career 3-pointers. Lotta offense both ways so far which is, to say the least, surprising. Ohio State leads 9-6 at the first break. #Badgers 2 of 5 overall, 2 of 3 from 3-point range. Buckeyes hit 4 of first 6 shots to take a 9-6 lead over #Badgers . OSU ball OB with 16:14 left. Buckeyes have hit 4 of their first 8 FGs. Brown and Koenig each have a 3 for the #Badgers . #Badgers Brown, 5-29 from deep over last 7 games, 1-1 so far. But he has missed both 2-point shots. Happ and Showalter back in out of the break. Koenig and Thomas take a seat.